"Until the End of the World" is a song by rock band U2 and the fourth track from their 1991 album Achtung Baby. The song began as a guitar riff composed by lead vocalist Bono from a demo, which the band revisited with success after talking with German filmmaker Wim Wenders about providing music for his film Until the End of the World. The song's lyrics describe a fictional conversation between Jesus Christ and Judas Iscariot. The first verse discusses the Last Supper; the second is about Judas identifying Jesus with a kiss on the cheek in the Garden of Gethsemane; and the final is about Judas' suicide after being overwhelmed with guilt and sadness. "Until the End of the World" enjoyed success on alternative and rock radio in the United States, where it was released as a promotional single; it peaked within the top 5 of Billboard's Modern Rock Tracks and Album Rock Tracks charts. It also peaked at number 69 on the Canadian RPM Top 100 singles chart. 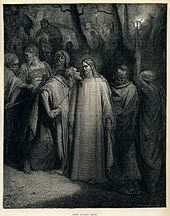 The song's lyrics describe Judas' betrayal of Jesus, depicted here in "The Judas Kiss" (1886) by Gustave Doré. "Until the End of the World" originated from a guitar riff by vocalist Bono from a demo called "Fat Boy" that the band recorded at STS Studios in 1990, prior to the Achtung Baby sessions proper. Although guitarist the Edge loved the riff, the band struggled to finalise a song from the demo during the album's recording sessions. After the band met with German filmmaker Wim Wenders, who was looking for music to use in his film Until the End of the World, the Edge was inspired to revisit the "Fat Boy" demo. In Dublin, he used the riff to assemble a backing track with bassist Adam Clayton and drummer Larry Mullen Jr. The composition excited the band so much, they decided to include it on the album. They told Wenders, "You can have it but we want it, too", while also informing him that they were using the film title for the song. According to Jennifer O'Brien of The Times, the lyrics were inspired by a brief falling out that Bono and the Edge had. Bono wrote the lyrics relatively quickly at his father-in-law's house in Wexford, having woken up with the idea of a conversation between Jesus Christ and Judas Iscariot. Bono had difficulty finding a key he could sing in, as he remarked that he sings most songs "a little bit too high or a little bit too low". Consequently, the only melody he felt comfortable singing was conversational. Reading poetry by John Keats, Percy Bysshe Shelley, and George Gordon Byron inspired Bono to touch on the theme of temptation in his lyrics. U2 and their production team expended considerable effort to finalise the song. The band added various overdubs during the recording sessions, including percussion loops by Mullen, as well as a sweeping guitar sound created by their engineer Flood that sounded like it went "between the speakers". Producer Daniel Lanois provided additional percussion, playing congas heard during the song's introduction. At one point, assisting producer Brian Eno believed the additions had negatively impacted the track. Eno, who would occasionally visit the studio and review material for a short amount of time before leaving, believed his distance from the album allowed him to provide a fresh perspective. He explained his assistance: "I'd go in and say, 'The song has gone, whatever it is you liked about this song is not there anymore. Sometimes, for example, the song would have disappeared under layers of overdubs." Eno aided the group in removing some of these overdubs. According to Hal Leonard Corporation's sheet music published at Musicnotes.com, "Until the End of the World" is played at a tempo of 101 beats per minute in a 4/4 time signature. The basic key is E major. David Werther, a faculty associate in Philosophy at the University of Wisconsin–Madison, compared "Until the End of the World" with U2's 1987 song "Exit" in an examination of the role music can play in catharsis. He noted that both were powerful songs, but that while "Until the End of the World" allowed the possibility of purification, which he described as the cleansing of the soul "through pity and fear", by placing the listener in the position of Judas Iscariot, "Exit" was an example of purgation, a freeing from excess pity and fear. Werther noted "'Exit' evokes feelings of fear, fear of losing control, giving into one's dark side, perhaps even taking one's life", contrasting it to the "waves of regret" experienced by Judas. Upon the release of Achtung Baby, many critics praised "Until the End of the World". Steve Morse of The Boston Globe thought it was the best song on the album, calling it a "raging rocker" with "fiery bass runs" by Clayton. Morse interpreted some of the lyrics differently from the song's original intent, noting that the lines "We ate the food / We drank the wine / Everybody having a good time / Except you / You were talking about the end of the world" were as if Bono was giving a "terse kiss-off to a former lover at a party". Rolling Stone praised The Edge's guitar playing on the song, noting that "he has always made inspired use of devices like echo and reverb" and "his shimmering washes of color" in the song are instantly recognizable. The Austin Chronicle singled out "Larry Mullen Jr.'s seismic turn" on the song as one of three moments on the record where the band has never sounded better. Patti Smith reworked the song for the 2011 tribute album AHK-toong BAY-bi Covered. "The punk poet turns in a twilight version…," wrote in Q, "finding dark, bottom-of-the-bottle desperation in its lyrics." Bono and Adam Clayton during a performance of "Until the End of the World" in Toronto on the U2 360° Tour. The song is U2's 11th most frequently played song in concerts, and has been played on every U2 tour since it debuted on Zoo TV Tour, except for The Joshua Tree Tour 2017 on which it was not performed. The song frequently segues into "New Year's Day". Only until the third leg of the Vertigo Tour did it not regularly secure a set list position, having appeared occasionally as a part of the Zoo TV-themed encore. By the fourth and fifth legs, it secured a regular set position it has occupied on tours past (before "New Year's Day"). It was played at an award ceremony when U2 won for Outstanding Contribution to Music at the BRIT Awards in 2001, along with "Beautiful Day", "One", and "Mysterious Ways". It was also performed when the band were inducted into the Rock and Roll Hall of Fame in 2005. On why the song has remained as a live staple despite not being released as a single, the Edge said, "I think it's an amazing song live because it really showcases everything the band does best. In terms of its visceral energy and impact, it's one of those songs that's hard to beat...It's got references to mortality, to all the big questions." It has appeared on the concert DVD releases Zoo TV: Live from Sydney, PopMart: Live from Mexico City, Elevation 2001: Live from Boston, U2 Go Home: Live from Slane Castle and U2 360° at the Rose Bowl. It also appeared on the CD and DVD versions of The Best of 1990-2000 compilation album. It was featured (in a different version) on the soundtrack to the movie Until the End of the World and also (once again in a different version) in the movie Entropy. A live performance, dedicated to Freddie Mercury, was shown at Wembley via satellite for The Freddie Mercury Tribute Concert. There was a video created for this song which appeared on the video release Achtung Baby: The Videos, The Cameos, and A Whole Lot of Interference from Zoo TV. However, it was never publicly released. There was also a live video composed of footage from two performances on the Outside Broadcast leg of the Zoo TV Tour, from Yankee Stadium and Houston, which appeared on The Best of 1990-2000 DVD. Edge has always used a Gibson Les Paul to play this song. On the Zoo TV Tour, he used the Les Paul Custom. On the PopMart, Elevation, Vertigo, U2 360° and Innocence + Experience Tours, he has used the Les Paul Standard Goldtop. Although the song was recorded in the key of E, live performances have always been played in a higher key, F# on Zoo TV and PopMart, G on all other tours. All tracks written by U2, with lyrics by Bono. ^ a b c d e f g h McCormick, Neil, ed. (2006). U2 by U2. HarperCollins Publishers. pp. 225, 227. ISBN 0-00-719668-7. ^ O'Brien, Jennifer (4 May 2018). "Bono gets high-tech and personal". The Times. Retrieved 1 September 2018. ^ a b c "Eno". Propaganda. No. 16. 1992-06-01. ^ "U2 - Until the End of the World Guitar Tab". Musicnotes. Hal Leonard Corporation. Retrieved 2010-05-07. ^ Morse, Steve (1991-11-15). "U2 bounces back". The Boston Globe. Retrieved 2009-10-13. ^ Gardner, Elysa. "U2: Achtung, Baby". Rolling Stone. Retrieved 2009-03-06. ^ Gray, Christopher (2001-03-30). "Review - U2: Achtung Baby". Austin Chronicle. Retrieved 2009-10-13. ^ "What's On Your Free CD?". Q: 6–7. December 2011. ^ Greene, Andy (31 May 2018). "The Edge on U2's 'Experience' Tour: 'This Is For Our Committed Fans'". Rolling Stone. Retrieved 9 August 2018. ^ "Search Results: Until the End of the World". RPM. 1992-03-07. Retrieved 2009-11-24. ^ "U2 Until The End Of The World Chart History". Billboard. Retrieved 2018-02-05. Werther, David (2006). "Chapter 15: Aristotle, U2, and the Abolition of Man". In Wrathall, Mark A. (ed.). U2 and Philosophy: How to Decipher an Atomic Band. Popular Culture and Philosophy. 21. Chicago: Carus Publishing Company. ISBN 978-0-8126-9599-1. "Tryin' to Throw Your Arms Around the World"
This page was last edited on 9 September 2018, at 02:53 (UTC).